Chandrika Srivastava (Yale University, CT) writes on Why Yale worked for her. 1. How important do you consider rankings and Ivy league status while evaluating schools? How have your perceptions changed about this now? As high school student, at first, I was definitely in love with the idea of attending an Ivy League school but when I began researching college options, I realized that there were several other great schools that have a lot, if not more to offer. I now understand that it is not just Yale I am in love with, but the Liberal Arts education which I receive. As a result, I do not consider Ivy leagues statuses to be too important when I evaluate schools as long as the academic programs are strong. 2. Did the geographic location (NE, Mid West, West , South) and setting (urban, rural, suburban, college town) of your college impact your overall assessment of your college experience? Did you think about this when applying? How did your perception change with time? New England had always had it’s own charm for me (despite the weather) because there are so many colleges in this region and I definitely had a bias towards it. But this was never the deciding factor when I was choosing between colleges. One thing I was certain about was that I did not want to go to school in a rural setting. I’m a city girl and I wanted to be relatively close to civilization. Yale is located in New Haven, which isn’t the best of cities, but is only an hour and a half away from New York city and I find that it’s the perfect distance: not so close that it precludes a campus life but close enough to take visit on a day off. I think it’s important to decide what setting you want your college to be in and choose accordingly. 3. Did you consider size (student population) as an important criteria while choosing schools? What do you think is a size that is ideal for you? Why? Having studied in Sanskriti School, where the average class size is 25, I was a little skeptical of going to a big public institution. I did apply to several great public schools which had the programs I wanted but I always wanted to go to a smaller school. Yale, with a class size of roughly 1300 in each year, is the perfect place for me. If you think about it, it’s still quite a large number of people but Yale has a great system of “Residential Colleges”. Much like we have the four ‘houses’ in schools, Yale has 12 residential colleges and each student is randomly assigned to one of 12 colleges at the beginning of freshman year. For the next four years, students live in suites within the residential college but are free to visit any of the other 11. Each college has its own dining hall, library, late-night-snackhouse and gym, in addition to a Dean- who takes care of all the academic related work for students in the college – and a Master – who looks after their residential and other requirements. This system goes a long way in making Yale more inclusive and homely and is definitely a bonus. 4. What was the average class size of your intro classes? Were you satisfied with this? In what way did this change your perception of your academic experience? What would you do differently? I took a wide variety of classes freshman year at Yale and the class sizes ranged from 14 (in French and English) to 150(in Chemistry) but they get significantly smaller as one moves into the major. Intro classes can be very large – reaching upto 200-300 students at times but that is an interesting experience too – finding study groups and working together on homework with a bunch of friends has a charm of its own and is a refreshing change from high school in India. 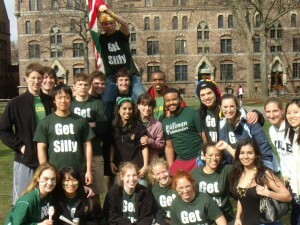 I am an Environmental engineering major – a major which, at Yale, has less than 10 students each year. As a result I know all my professors individually and have no trouble finding summer research opportunities or internships. 5. What is your current major interest? Did this change over time? Explain if it did? Do you think that the courses you took to fulfil general education requirements were good? What would you change about the choices you made? I am majoring in Environmental Engineering. I have always been interested in studying about the Environment and the program at Yale fit me perfectly. At Yale, each student must fulfill distributional requirements by taking at least 2 courses in the following areas: Humanities, Social Science and Science and also fulfill the Skills requirements by taking at least 2 courses in the following: QR, Writing and Foreign Language. The classes that I’ve taken to fulfill these requirements have been the most interesting classes for me which is not surprising because Yale has a plethora of amazing professors and an unimaginably large course catalogue. Fulfilling these requirements is a lot of fun and not a burden in any way and in fact, taking these other courses has taught me some great things that I wouldn’t have ordinarily chosen to learn about. 6. Was the ratio of international students/total population an important criteria in your selection of schools? Did you feel trapped in any sort of bubble or clique? Did your perceptions about diversity change while you were in college? This wasn’t a factor when I was deciding to apply to colleges: I suppose I just never really thought about it! Yale, however, has a very good ratio of international students – one in every ten students is international and about 9-10 students are selected from India every year. This gives the student body a very diverse flavor. Yale hosts a 3 day pre-orientation for all internationals and we develop a strong bond even before college starts. Even once college begins, it is easy to settle in and mingle with other Yalies as most students are interested in foreign affairs and in learning more about the world. What I also love about Yale is that it has the perfect South Asian population: from India, Pakistan, Bangaladesh and Sri Lanka etc… There are enough of us that we can celebrate festivals like Holi, have a Bhangra team and find enough interested people to host events with eminent speakers from the Sub-Continent, but not so many that we remain in our little South Asian cocoon all the time. 7. What were the two or three things that you discovered about your school that really worked for you? My favourite thing about Yale, without a doubt, is the two week “Shopping Period” we have at the beginning of each semester. Essentially, students have two weeks during which we can “shop” any class we want i.e. attend any class offered by any professor for two weeks without registering for it (and with the added liberty of walking out at any point in the lecture!) and pick 4-5 classes at the end of Shopping Period, that you will study for that semester. Most of my friends at other schools have to pick their courses in the previous semester or register online and basically take classes with barely any idea of whether they will like it or not… I cannot imagine doing that because at Yale, I have 2 weeks, every semester to gauge the feel of the class, the professors teaching style and of course also balance my workload according to the other classes I am interested in taking. It is this flexibility and atmosphere of experimentation and openness that I love the most about Yale. We are constantly reminded that it’s okay to not know what we want to study and that we should try all kinds of things in the hope of discovering our true passion. I wouldn’t trade this education for anything in the world. Newer PostUrvi Nopany (Yale University ’14) describes what she would do differently with her applications.